Compliance and Risk Management | NGK INSULATORS, LTD. Viewing compliance as the foundation of CSR, the NGK Group positions enhancing trustworthiness as the most important initiative and strives to create specific systems to inculcate this view among employees, prevent corruption, and comply with laws and regulations. We established the Compliance Subcommittee under the CSR Committee to ensure strict observance of laws, regulations, and corporate ethics within the Group. The Security Subcommittee has also been established to ensure accident prevention measures are in place, widely known, and strictly practiced. In addition to mandating compliance with the Antimonopoly Act in the NGK Group Guidelines for Corporate Behavior, we have established Competition Laws Compliance Rules, set forth to comply with international standards, which are strictly enforced by NGK both in Japan and its overseas locations. We have established these policies and procedures in order to eradicate unfair business practices and maintain fair and equitable business relationships with our business partners. We also provide education and training aimed at ensuring widespread awareness and thorough compliance with the Competition Laws Compliance Rules and the Competition Laws Compliance Handbook. Furthermore, since fiscal 2015, we have contracted PwC Advisory LLC (renamed from Pricewaterhouse Coopers Co., Ltd. in March 2016) as our independent compliance professional to annually review the implementation status of the NGK Group's Competition Law compliance program per the Competition Law Compliance Rules as well as assessing the overall oversight and reporting structures in place for NGK Group companies, both in Japan and overseas locations. On top of this, starting in fiscal 2017, PwC has also conducted interviews with the directors overseeing NGK's various business groups to assess the tone of each director's approach toward competition law compliance as well as to further enhance their awareness of these efforts. The results of these reviews are being leveraged for a variety of purposes, such as improving the Competition Law compliance program. The NGK Group implements anti-bribery measures in order to ensure fair and transparent transactions. In fiscal 2015, we instituted anti-bribery rules for dealing with foreign public officials in order to ensure compliance with anti-bribery laws as well as ethical standards for business conduct. Further, in fiscal 2017 our Auditing Department performed a review of overseas money transfers and entertainment expenses. As part of its full compliance efforts, NGK is engaged in strictly observing laws and regulations related to import and export control. NGK establishes the observance of security export control-related regulations as part of Behavioral Guidelines within the NGK Group Guidelines for Corporate Behavior, and makes sure to control import and export operations by training its employees based on internal rules and the Export/Import Handbook. Additionally, we are updating the rules and regulations for our EU-based affiliates in order to comply with the EU's General Data Protection Regulation that went into effect on May 25, 2018. 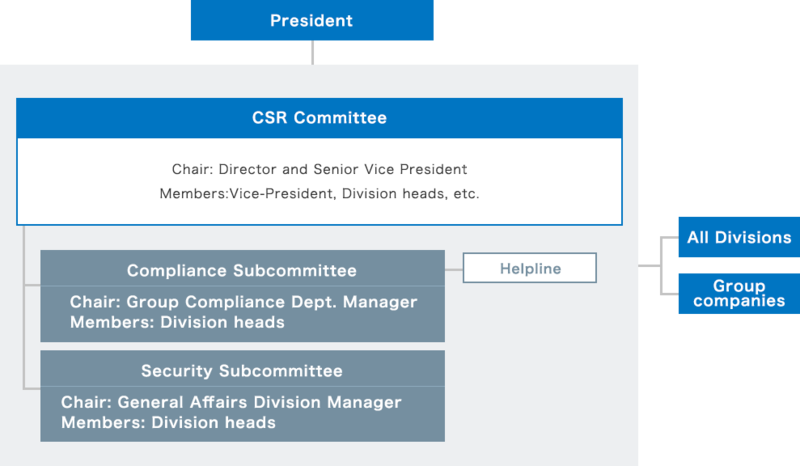 The NGK Group CSR Committee's Security Subcommittee takes responsibility for supervising overall information security, and supports the General Affairs and Information Systems divisions based on the Basic NGK Group Information Security Policy, in an attempt to properly manage and operate information assets. Every year, personnel of NGK's Information Technology Department visit several Group companies to conduct on-site checks and provide guidance on their implementation of IT security measures. In fiscal 2017, 15 overseas Group companies received such inspections. There were no violations of laws or regulations in fiscal 2017.